The BA plane that crashed at Heathrow in January was probably brought down by ice in its fuel system, an accident report says. 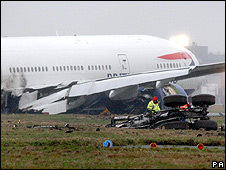 The pilots of the Boeing 777 managed to land so that the 136 passengers and 16 crew escaped without serious injury. The Air Accident Investigation Branch believes the flow of fuel dropped causing the engines to lose power less than a minute before touchdown. But investigators say they still do not know how the ice could have formed. Water is naturally present in aviation fuel and the investigators believe there may have been as much as five litres within this aircraft's fuel load. But the report says levels of water found in fuel recovered after the 17 January crash were very low for a Boeing 777. They dismissed the suggestion that the fuel itself froze or became "waxy" as icing occurred. The report says the plane flew through unusually cold air over Siberia while en route from Beijing to Heathrow. The fuel temperature fell to -34C (-29F). But jet fuel should not freeze until it is at less than -57C (-70F), and the report says the temperatures involved were not "unique". The investigation into the crash of flight BA38 continues with testing at Rolls-Royce in Derby, and Seattle in the US, the home of Boeing. Following Thursday's report, a spokesman for the US Federal Aviation Administration said it would be issuing an air-worthiness directive to US carriers operating Boeing 777 aircraft. This was likely to be about "changes in procedures for pilots to follow in certain cold weather conditions" as well as "changes in certain fuel procedures on the ground", he said. While it would not be an emergency directive, it was likely to be issued within 24 hours and would have immediate effect. Water in aviation fuel can be dissolved at the molecular level, or simply float as free water, suspended in the fuel. As the fuel gets colder tiny droplets can form and freeze. The mystery facing investigators is why this might have happened on an apparently fully functioning aircraft. Water in the fuel is controlled by draining it regularly out of the fuel tanks - and on the Boeing 777 a so-called "scavenge system" pumps it out. Ice can form when the fuel temperature drops to around -1C (30.2F) to -3C (26.6F) Generally the ice crystals simply float and drift in the fuel without causing harm. Only when the temperature falls further does the ice stick together. Within the fuel system a heat exchanger is used to increase the fuel temperature, but it is possible the blockage might have occurred before this point. The investigation team have built a test rig and introduced pre-prepared ice into the fuel system to see if it would clog up. But the amounts they had to put in to make this happen were far greater than is normal. Despite that, the scenarios being considered by the AAIB are based on the idea that the ice formed gradually in the system and was released as the plane prepared for landing. This accident remains an enormous challenge for the investigation team. But their report stresses the rarity of this crash. It said: "The accident flight was unique in that this has been the only recorded case of a restricted fuel flow affecting the engine performance to the extent of causing HP pump cavitation" - the damage found within the pumps that alerted the investigators to the loss of fuel pressure. The report goes on: "This is the first such event in 6.5 million flight hours and places the probability of the failure as being 'remote'." In response to the recommendations, the European Aviation Safety Agency said it had agreed with the FAA to "interim measures" for "mandatory aircraft level action", but gave no further details. It also said it would examine the other recommendations. An FAA spokesman said it was still studying the report but felt the initial review indicated that the issue appeared to affect only Boeing aircraft with Rolls-Royce Trent engines. He understood that Boeing was carrying out tests to establish whether other aircraft with other engine combinations could similarly be affected. He emphasised that shorter-haul aircraft such as Boeing 737s would not be part of the directive as icing was a problem that affected only long-haul journeys. 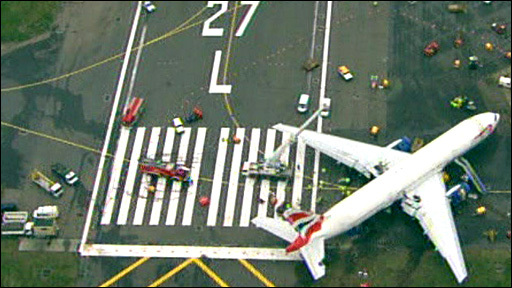 Flight BA 38 from Beijing was extensively damaged when it touched down on 17 January, landing short of the runway but staying largely intact. One person suffered a broken leg and others received minor injuries during the emergency evacuation.